In response to the upcoming AIAG-VDA FMEA Alignment, we are offering a FREE weekly newsletter to help you get ready for the changes. Thousands of people and hundreds of companies have trusted us to help learn and implement FMEAs so we have a responsibility to guide quality professionals and their FMEA team member colleagues into the next phase of FMEAs. 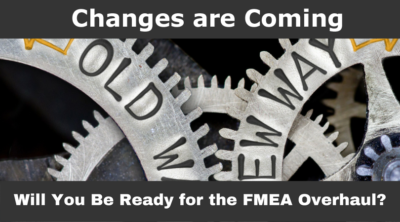 And, because we are already working on new FMEA courses based on the proposed AIAG-VDA FMEA Alignment Handbook, we are getting comfortable with the changes that at first, quite frankly, can seem daunting. This newsletter will highlight the changes, answer your key questions and guide you through the transition in 12 weekly issues. We know that most people don’t have a day to sit down and digest the entire new handbook. But, most anyone can spend 5-10 minutes a week with our short, succinct analysis of the key changes to FMEAs and how it will affect how you conduct FMEAs in the future. How to get a draft review copy of the proposed new AIAG-VDA FMEA Handbook (though the end of February 2018). 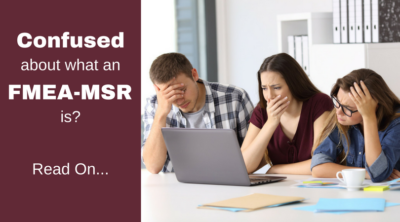 How the new changes will impact your existing FMEAs. Why the RPN is going away and what it is being replaced with. The new way that action plans will be prioritized. When you subscribe, you will receive the very first issue of the AIAG-VDA FMEA Alignment Weekly Advisor and will receive a new issue every week for the next three months.